Today our expert guest is Kyle “Mind Brain Dude” Ferroly, and he’s going to talk about the brain in ways that you’ve probably never thought about. Kyle completed his Doctoral training in Psychophysiology, which we discuss at great length in this episode, in addition to doing advanced EEG training with some of the top professionals in the field, who are making incredible advances in brain research. So, what in the world is Psychophysiology? Psychophysiology is the blending of three disciplines: psychology, physiology, and neurology – or, in other words, it’s the holistic study of the mind, body, and brain. You might be wondering, then, what’s the difference between the mind and the brain? The brain is a physical organ that we have. The mind is our conceptual ability to think, act, and feel. We can’t prove we have a mind – philosophy has been trying to do it for who knows how many years – but we know that we can think, act, and feel. So there has to be something that gives us the ability to do that, and that is our brain. So, although our mind can seem like more of a philosophical concept than a core part of ourselves, practitioners in the field of Psychophysiology can help us see what our mind, brain, and body are doing through scientifically verified assessments. Because this ephemeral part of us is critically important to living happy and fulfilled lives, and too many of us are being crippled by stress. People may be motivated to change, but until you’re able to show them evidence that something is wrong, it’s hard to show them that there is a problem. And for many of us, that problem is the effects of overstressed lives. Whether you’re being chased by a bear or you imagine you’re being chased by a bear, your body is going to respond in a similar way – and in that equally powerful response, we can begin to understand how the mind, brain, and body are all interconnected. 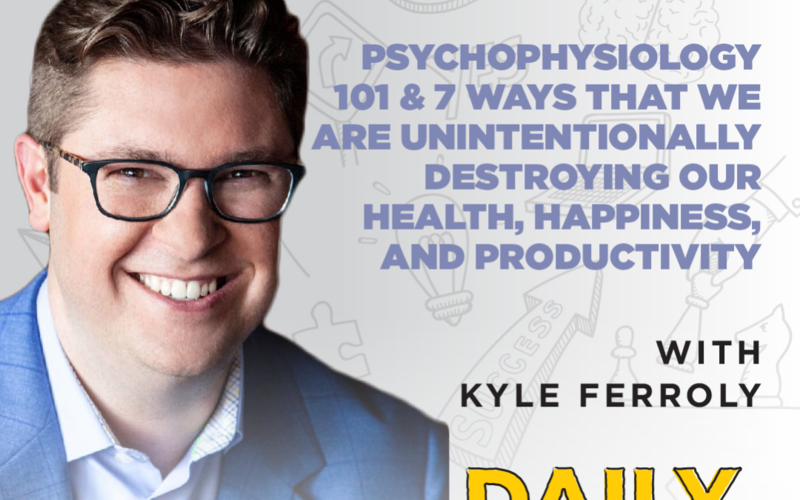 We need to get to the root of the problem and stop chasing symptoms – and that’s why Kyle wrote his upcoming book, Check Your Blindspot: 7 Ways That We Are Unintentionally Destroying Our Health, Happiness, and Productivity. “Albert Einstein once said that problems cannot be solved with the mindset that created them. We all have a certain mindset or a current frame of mind for how we are going to get through our problem. We need new information, we need new tools, and we need to get in front of the problem – and that’s what I feel the field of Psychophysiology will do. It will give you a new frame of reference for what’s happening inside of you.